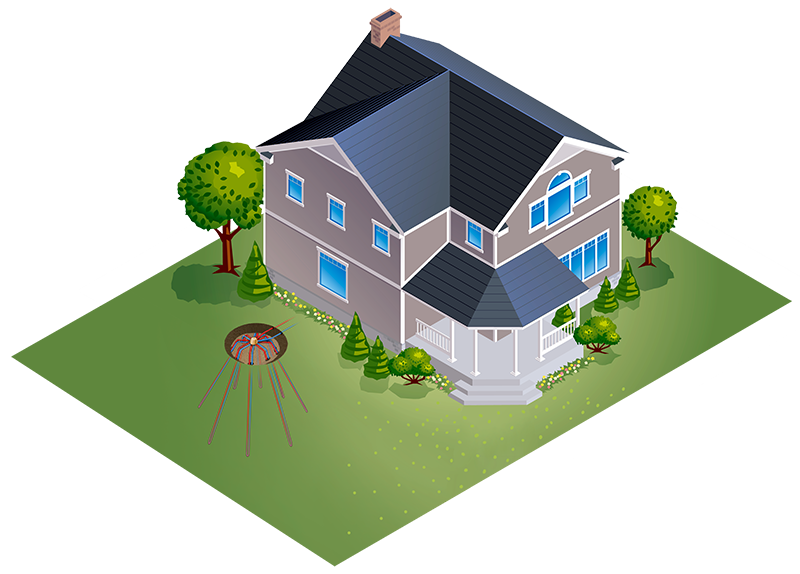 If you’re interested in using a DX geothermal system to heat and cool your home, your contractor will start by determining which loop design is right for your needs, space, and home. There are four different types of loop configurations that could be installed depending on your property. Each home or building should be calculated to its heating and cooling requirements. This will determine the size of you system and how many ground loops are needed. Loop configurations are decided based on your property size and its land features. A diagonal ground loop configuration is drilled at a uniform angle between 70 to 100 feet into the ground using a small drilling rig and uses between four to 12 loops per system. This type of configuration allows the installer to dig a three foot diameter hole at the surface. 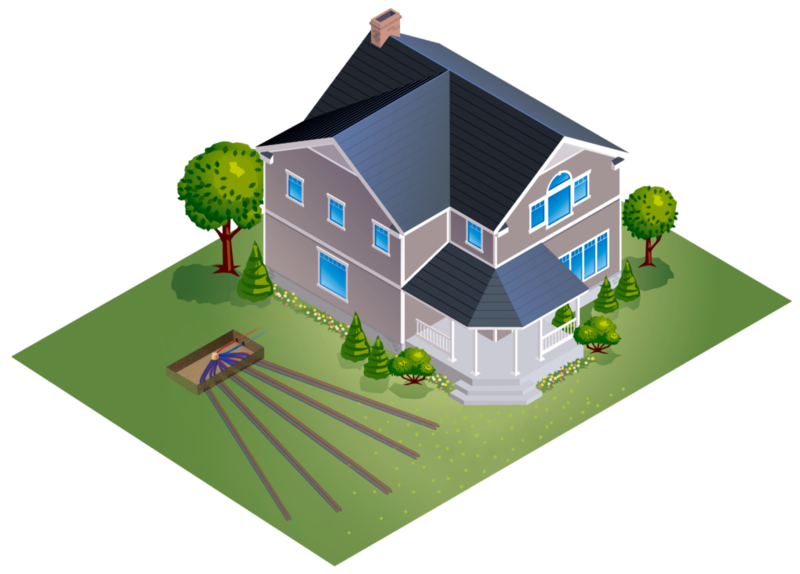 Because it only requires a small amount of space and a trench that leads to the home, less of your yard will be torn up. This results in superior efficiency even when space is limited. The three foot hole combined with the diagonal design enables an installer to maintain proper distance between loops for proper heat transfer, while digging up less yard. A vertical loop configuration is dug using a drilling rig to bore 100 feet into the ground. The vertical loops are placed up and down (vertically). Using two to six loops, they are placed at an appropriate distance apart which allow them to transfer heat appropriately. This requires less space than horizontal loops and achieves greater efficiency when yard space is limited. 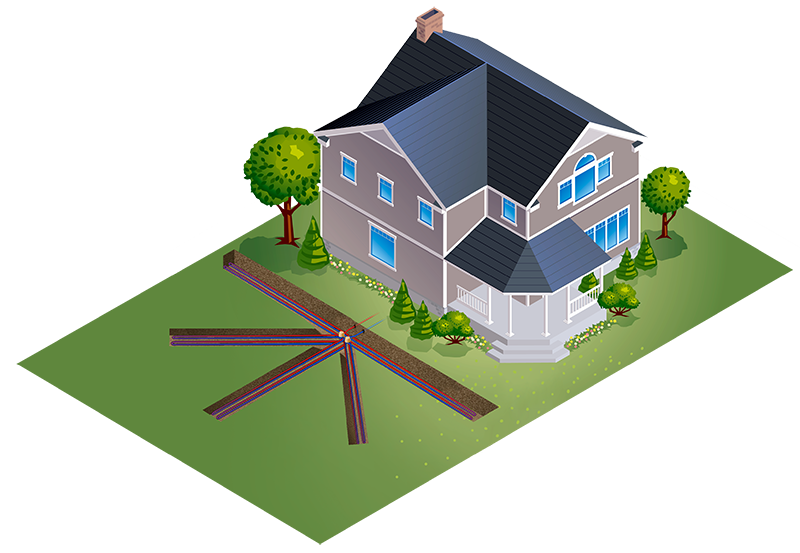 A horizontal loop configuration takes up the most amount of land but allows you to dig multiple trenches on your property which can save on your installation costs when yard space is not an issue. A typical system requires four to 12 loops to be installed depending on the size of the system and square footage of your home. Sometimes referred to as a vertical bore and other times referred to as a horizontal bore; a directional bore loop configuration is really a hybrid between both a vertical and a horizontal ground loop. The loop length will typically extend out approximately 75-125 feet in several directions, while being buried anywhere between 10 to 15 feet deep. Although this design requires a larger area of land, it also can be installed with minimal digging to your yard. Using anywhere between 2 to 6 loops per system, the loops are appropriately spaced apart. Which allows them to transfer a good amount of heat from 15 feet below the surface of the earth. The loops are pushed into the ground and fan out into a hand shaped pattern returning back to the house at one location. Wondering how these ground loops gather energy from the earth? Learn how direct exchange geothermal works here. Simple. Efficient. Effective. Explore the possibilities with Waterless™ Geothermal. Find Out if Waterless™ Geothermal is a good fit for you!